Norpro 3 Tier Cooking Rack NORPRO 3 TIER COOLING RACK  - $7.00 : Big City Market, Big City Market Delivers it All! Baking cookies is fun, but who has the space for several individual cooling racks? 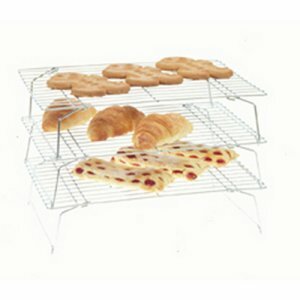 This 3 Tier Cooling Rack by Norpro will save counter space as well as cooling a larger amount baked treats at one time. Each rack measures 14 inches long by 10 inches wide by 3.5" inches in height. Made of Chromed steel. Hand washing is recommended.